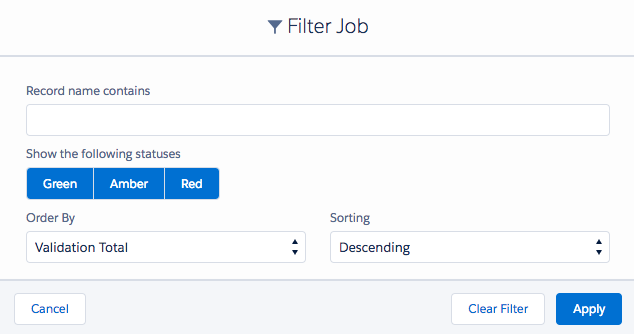 Record Validation Results filter can be configured in a way to find and show only jobs with criteria defined by the user. The filter can be accessed from the top right corner on the Record Validation Results Overview page by pressing the icon. Record Name Contains Show records containing the defined value in their names. Show the following statuses Show records with the following Record Validation Status only. Order by Order the results by status color or by status count. Sorting Sort the results in Ascending or Descending list. Clear Filter Clear current filter configuration.